El millonario Harry Brock contrata al veterano periodista Paul Verrall para que convierta a su novia Billie, una ex-bailarina de Las Vegas, en una mujer culta y refinada. 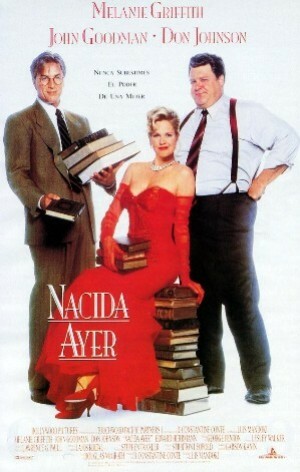 Melanie Griffith, John Goodman, Don Johnson, Edward Herrmann, Max Perlich, Michael Ensign, Benjamin C. Bradlee, Sally Quinn, William Frankfather, Fred Dalton Thompson, Celeste Yarnall, Nora Dunn, Meg Wittner, William Forward, Mary Gordon Murray, Theodore Raimi, Rondi Reed, Matthew Faison, Kate McGregor-Stewart, Arthur Leeds, John Wesley, Andi Chapman, Drew Snyder, Terri Hanauer, John Achorn, Ann Hearn, Gordon Reinhart, Selma Archerd, Catherine Hausman, Freda Foh Shen, Marisol Massey, Dr. Leroy Perry Jr., Tony Palladino, Amanda Hendon, Fritz Sperberg, Robyn Renner, Paul Guyot. Luis Mandoki (Dirección), Lajos Koltai (Montaje), Douglas McGrath, Garson Kanin (Guión), George Fenton (Música).